Alan Stubbs summed up the feelings of all Hibs fans by admitting that, after the victory at Ibrox five days earlier, anything other than a win against Raith Rovers was a disappointment. The air of expectancy which hung over Easter Road was well and truly punctured by this draw, one which resulted in the gap between Stubbs’ side and Championship leaders Hearts widen to a yawning 12 points. 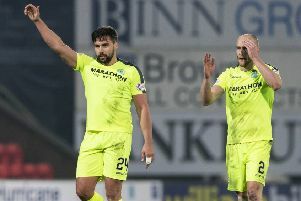 Not an insurmountable advantage given, as Hibs goalscorer Scott Robertson highlighted, the Capital rivals have still to meet a further three times this season. However, for the time being, he and his team-mates are still struggling to find the consistency which their city neighbours appear to have in abundance having dropped just two points thus far. Hibs, on the other hand, have shed too many for their supporters’ liking, there’s already been too many occasions such as Saturday when they’ve failed to live up to expectations, the tag of favourites seeming to hang heavy on their shoulders. Prior to kick-off, Stubbs had highlighted the necessity for maximum points from the visits of Raith and, this weekend, Dumbarton, two home games offering the opportunity for Hibs to at least ensure they didn’t lose any further ground on those at the top with the obvious hope being that it would actually narrow the gap. The fact it has widened may be disconcerting the fans but, Robertson insisted, it’s not a problem at the moment with 28 matches still to play. The midfielder conceded, however, it will become so should Hibs continue to drop points at the rate they have to date. The derbies will, of course, take care of themselves, but the frustrating thing for Stubbs will be the obvious struggle his side have had in dealing with those teams outwith the so-called “big three” in the Championship. As the head coach pointed out, Hibs have lost just once at Easter Road but it’s been obvious to everyone that they have been less than convincing on their own turf while, other than that impressive victory over Rangers, they’ve been just as unsure of themselves while on their travels. The League Cup win against Premiership outfit Ross County followed up a few days later by that triumph in Govan had given the impression that Hibs had, at last, found their feet, the opening weeks of the season a period of transition with a new management team in place and a host of new players bedding in. But a basic difficulty remains as Robertson admitted. Hibs struggle to break down teams intent on a defensive strategy and are made to pay when such opposition, as they inevitably do, create an opening of their own. Falkirk, Alloa and Queen of the South have all suckered Stubbs’ side already and, despite falling behind on the stroke of half-time and only minutes after Barrie McKay had rattled Mark Oxley’s crossbar with a thundering shot, Raith rallied after the interval to the extent their boss Grant Murray claimed they could have headed back over the Forth with all three points. A point, though, was thoroughly deserved, Raith’s equaliser coming, inevitably, from Christian Nade, the former Hearts striker having endured unrelenting taunts from the Hibs support but having the last laugh as he whipped off his shirt to reveal his slimmed down torso. It brought him a booking but it was a price he was happy to pay, revealing that even while playing in Thailand he couldn’t escape the torment from some Hibs fans via social media. “I’d waited for this for a long time,” he grinned afterwards, “I had so much abuse outside the pitch, in life in general so I was waiting for that. I knew I was going to score. Nade’s goal was met with equal delight 80 miles away in Dumfries as Hearts completed yet another comprehensive dismantling of their opposition, beating Queen of the South 3-0. Hibs, however, once again showed one goal is, for them, rarely enough. Attempting to protect such a slender advantage is always fraught with danger, one moment of magic, one mistake or, as on this occasion, a slice of luck, liable to shatter hopes of victory. Murray, though, would argue his side deserved the touch of good fortune they enjoyed, Ryan Conroy’s shot deflecting into the path of Nade for him to steer a low shot home, Raith having taken control of the game in the second half. A terrific block from Paul Hanlon prevented Conroy adding a second as Hibs toiled to get forward in search of their own matchwinner, too many passes failing to hit the intended target while, in desperation, there were instances of the wrong option being taken, shots fired off when team-mates were far better positioned. Stubbs conceded a draw was probably a fair result while expressing his disappointment that his side couldn’t see the game out at 1-0. He said: “Overall, I did not feel we did enouigh in the game. “I thought we defended well enough at the goal but there’s a slice of luck, it’s fallen into his [Nade’s] path off a deflection when, on another day, it falls for you. I felt even after the first ten or 15 minutes it was going to be a difficult game to win. “It was going to be a game where it was 1-0 and we had to see it through because I didn’t think we were fluent enough.